My wonderful friends in the Choo Choo Quilters Guild (my local quilt guild) have offered to help me make quilt blocks for the Quilts of Valor project. We'll be using the 10th anniversary block pattern (shown here) with the assembly instructions below. The Choo Choo Quilters will collect completed blocks at the June 17 guild meeting so they can be sent to Dennis Taylor, Region 8 Tennessee Coordinator, who will be attending the Leadership Conference in Nebraska in July. Cutting: four 2.5" squares BLUE, two 3" squares ALTERNATE BLUE, two 3" squares WHITE, four 2.5" x 4.5" rectangles RED. Refer to the photo for color and unit placement. Sew the half square triangle units to the blue squares. Sew this unit to the red rectangle. Make 4 of these units. Assemble four units as shown in photo. The unfinished block (raw edge to raw edge) should be 8.5" square. All blocks MUST be red, white or cream, and blue. You may mix these colors in any position. Sign each block with your first name and state. Do not trim the blocks. Unfinished blocks (raw edge to raw edge) should be no smaller than 8.5" square. Adjust your seam allowances as necessary. If you'd like to contribute a block or more, e-mail me and I will send you my address or Dennis' address. 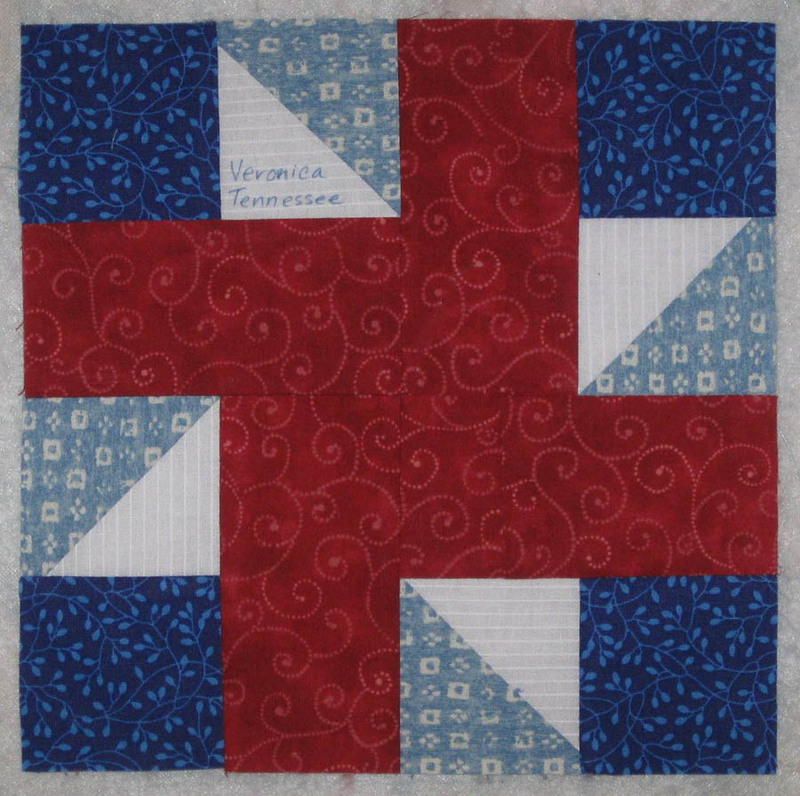 Blocks can also be made through November 2013 in honor of the 10th Anniversary and given to a local Quilts of Valor Group Leader or an Official Under Our Wings quilt shop. 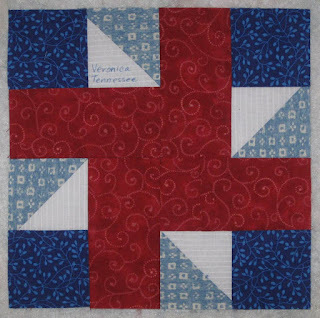 A downloadable PDF pattern of the 10th Anniversary block is available on the QOV web site here if you'd like to share it with your guild and quilting friends. Thanks for your assistance!